I’m getting ready for a major pool tournament in Philly next month. I thought about all the places I have played and remembered there are stories of this in a later chapter of Crossroads. I hope you enjoy these snippets of fun in strange places. I learned how to shoot pool in high school. It took me into some pretty rough neighborhoods in the Pittsburgh area at that time. A couple of scuffles later, I turned into a “better than average shot’. In fact nine-ball (a game generally played for money) helped to pay my way through college. Looking back at it, I would have spent the time learning to play the guitar instead, but be that as it may, pool has been an interesting part of my life, especially as I have traveled. 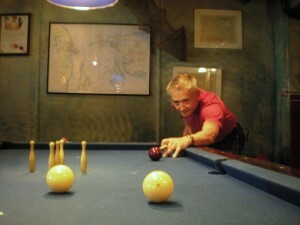 If time permits, I try to stop in a pool room in any country that I visit. The results have always been fascinating, and never as tough as it was in Pittsburgh in the 50’s and 60’s. In fact, I have nothing but pleasant memories in any place that I have visited. I think this has to do with the fact that I can play just a little better than people expect when I first walk in. 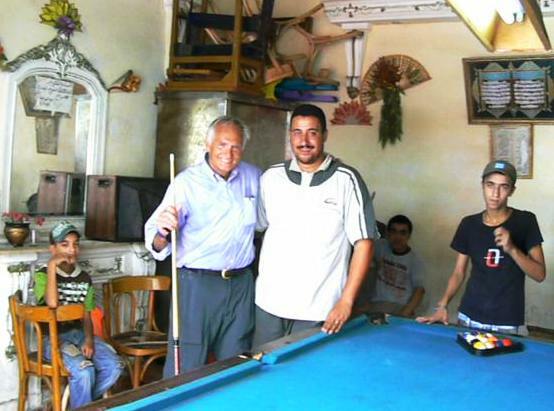 When I was doing field work in small towns for both the Guatemalan and Costa Rican government, I would always find the pool hall the evening I arrived, and stop in to learn the local game. “Campesinos” (local rural folks) loved this. By morning I was known to most of the small community, and life as an “outside” researcher became much easier. Not only did the men know who I was, but for some reason even the kids knew about this “pool shootin’ gringo”. They even wanted to help with the questionnaires that I was administering. The down side to this was the custom of buying the winner a drink after the game. We are talking about very strong liquor made from a sugarcane base and local fruits, known as “guaro”. After winning a couple of games, it was important to lose. This happens for two reasons: first, you always wake up with a headache from too much of this local stuff, and secondly, after a couple of those drinks, you don’t play as well anyway. I would leave after it was my turn to buy a few rounds. Everyone was happy. Pool (with pockets) and three cushion billiards are common in Vietnam. Every city and town has a place to play. Most of the people who frequent these places are young men or very old men. In the major cities, however, the attendants for the pool halls are women. They serve drinks or will volunteer to play as your opponent. They are young, attractive, and very good. If you miss more than once, the odds are you will lose the game – and games go quickly. On more than one occasion, given my age, I was asked if I was a returning Vietnam veteran. It was a perfectly reasonable question since there are many ex-soldiers who have returned to this place now so different from their past. In the vibrant, entrepreneurial center of Ho Chi Min City, shooting pool with young men and women, this was a question that brought me back to the reality of what had happened to their country over thirty years ago. It was a sobering thought that made concentration on the nine-ball seem almost silly. 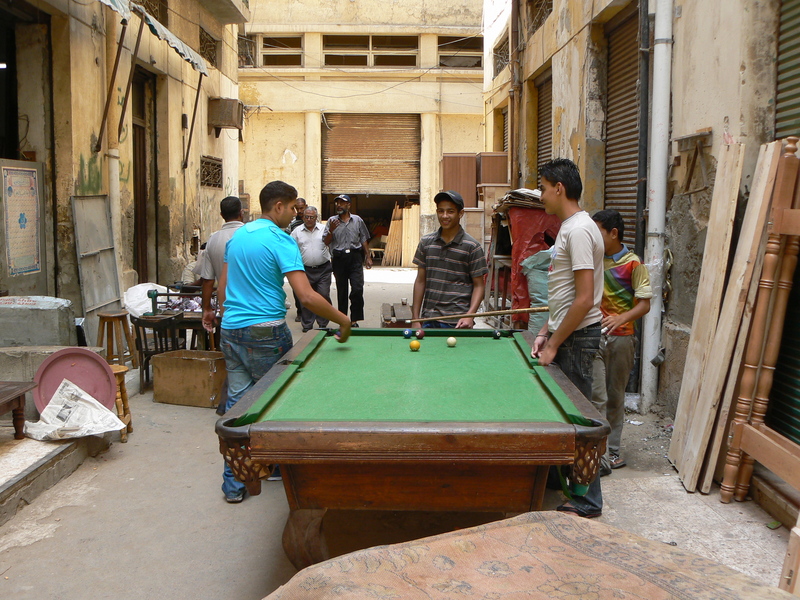 In Cairo, a few alleys have pool tables outside or even on the sidewalks. Not as popular as in Latin America, Egyptians still play the game. My Arabic is practically nonexistent, but the game has a cross-cultural dimension that easily lets me become part of the local scene. So it was in Egypt. Eight Ball was the favorite local contest. There was a variation from the rules in the United States, at least in the room I was playing in. You had to bank the eight ball (the last ball to make) at least three rails to win. This served two purposes as far as I was concerned: one, it made the game much harder and gave both players a chance to get to the eight ball because it’s difficult to find a three rail “lane” with all of the other balls still on the table; and two, the game lasts a long time. In this Muslim country no drinks were served during or after the game except tea or coffee. The game I was playing took even longer. In the middle of the match my opponent asked if he could be excused for about fifteen minutes. I of course said, “yes, no problem”. It was a noon time call to prayer. He and all of the other men in the place went into the street and faced Mecca to pray as their religion dictated. About twenty minutes later he returned, smiling, and we finished the game. After about an hour together playing pool, we managed to talk (using his limited English) about the future of Egypt and its place in the Middle East. He drank tea and served me a strong espresso. 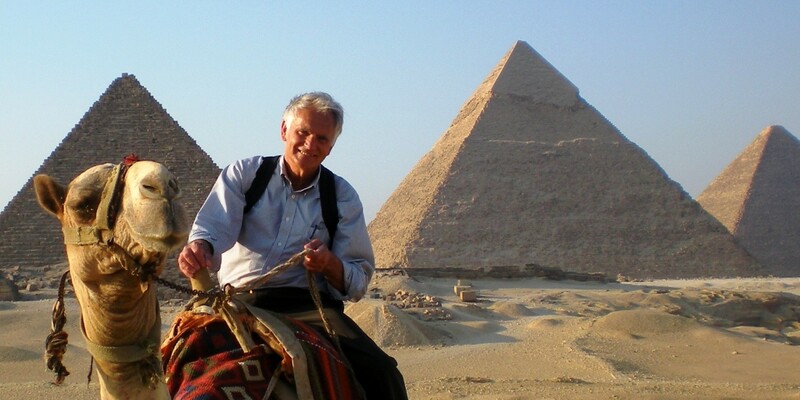 It was a memorable afternoon in the back streets of Cairo. Pick a number between 2 and 9, and don’t tell me what it is. Multiply that number times 9. I know the answer is 2 digits, add them together. Whatever you got when you added them together, subtract 5 from that number. If A equals 1, and B equals 2, and C equals 3, go down the alphabet until you find the letter that matches your number. The second letter of that country, think of an animal that starts with that letter. Think of the color of that animal? Of course you have a gray elephant from Denmark. And I used this joke when I was playing pool at a bar in Kosvor, Denmark. They seemed to like it, but then again they seemed to like everything. Even in a Jet plane, Denmark is a long way from Egypt. And by almost every other measure besides distance, it is a very long way from Egypt. Korsor, Denmark is a relatively small port about 40 miles from Copenhagen. Cobblestone streets, Lutheran church, bakeries with strawberry and whipped cream treats, a small modern shopping center, and all of the trappings that go with a fishing seaport town – that is Korsor. Oh I forgot, bars. The Danish drink. And they laugh a lot and they want you to drink too. They are even more social as the evening progresses. When you are shooting their type of pool (banking a ball and trying to knock over a few pegs placed on the table), you are expected to be part of the whole scene. Rounds of drinks come from practically anyone in the place. (Honestly, I really didn’t drink that much, but it was nice to know that in the morning, there would be great espresso and a Danish on the square – a great kick-start). I could go on and on with pool stories from different countries, but that’s not the point. The point is: find things that interest you and talk with the people that enjoy the same thing in other places. You already have something in common and it is a good way to get to know a different place, culture and people. Birders love birds, no matter where you are. Chefs love cooking. Motorcyclists love bikes. Visit not for profit agencies. If you want to know about the issues in a place with which you are not familiar, these activities will provide you with a local point of view. They are happy to explain why they are so passionate about their causes. It will give you a chance to see firsthand, direct work with residents of the country. In many countries, Peace Corps volunteers are more than happy to explain what their projects are all about, and always there will be a local connection with their work. Such conversations with volunteers give them pride in what they are doing, and give you insights into the place and people not normally obtained by tourists. I’m sure you get the idea. It is a rewarding way to become involved with the local place.